​R. 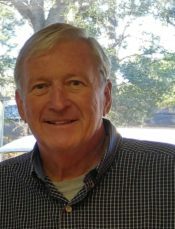 Gerald “Grandpa” Rutherford, Jr. 65, of Pensacola passed away Monday, November 19, 2018 in his home following a courageous battle with kidney cancer. ​Gerald was born November 21, 1952 in Pensacola, Florida to Royce Gerald Rutherford, Sr. and Virginia Stefani Rutherford. ​He was preceded in death by his father Royce G. Rutherford, Sr. He is survived by his loving wife of 44 amazing years, Teresa; a daughter, Jennifer L. Rutherford; a son, Gregory R. Rutherford; mother, Virginia S. Rutherford; sister, Barbara Cole Ware (John); brother, Donald W. Rutherford; grandchildren Jaxon R. Popple and Harper R. Leopard; special in-laws, Sharlene Wingate, Edward Daly (Terri), Steven Daly (Monica); many extended family members including a special cousin, Best Man and close friend, Wally Roberson. ​Gerald attended Ensley Elementary, Woodham High and graduated Tate High School in 1970. He completed his Refrigeration Certification at Pensacola Junior College in 1973. He was a member of the Delta Kappa Alpha Fraternity and Pensacola Big Game Fishing Club of which he remained in close contact. He was employed with the Pensacola News Journal Circulation Department while attending college then went on to obtain his refrigeration technician position with Sharpe’s Icemaker Distributor of Mobile until he opened Commercial Ice Systems, Inc. in June 1981 along with his business partner and wife, Teresa. Together they have had many wonderful employees including Richard Goolsby and their son, Greg who followed his dad’s footsteps at an early age and will continue to serve the community with their time and talent. ​He loved Nascar Racing and traveled to many races bringing family and friends in their motor home and rooting for his favorite drivers; Bill Elliott, Dale Earnhardt and Dale Jr. He also loved the water including boating, fishing and just sitting on the beach. He fished many Big Game Fishing Club Tournaments and was great at purchasing used boats and refurbishing them to look like new. Gerald treasured his time with their children and grandchildren and loved them dearly. He cherished his Mom who was always there for her family including the recent vacation she provided for Gerald, Teresa and herself cruising to Nova Scotia Canada to help him take his mind off his worries. ​Gerald will be greatly missed and was loved by all for his willingness to share his many talents and giving nature. ​Visitation will be Tuesday, November 27, 2018 at 5:00 to 7:00 p.m. and Funeral service Wednesday, November 28th at 11:00 a.m both at Pensacola Memorial Gardens with Fr. George Sammut officiating. Burial will follow at Pensacola Memorial Gardens. ​Pallbearers will be Wally Roberson, Rusty Thompson, Billy Wingate, Christopher Daly, Edward Daly, and Steven Daly. ​The family would like to thank his oncologist Dr. Inclan and staff at the Woodlands and Covenant Care team with special thanks to his nurse, Marti. ​Donations may be made to Covenant Care, 501 N. 12th Avenue, Pensacola, FL 32504 or American Cancer Society in memory of R. Gerald Rutherford, Jr.
​Arrangements are by Pensacola Memorial Gardens Funeral Home. Prayers, hugs and love to all of you. A great man who will sorely be missed. You were a wonderful caretaker Teresa and I know Gerald loved you so. Gerald was a wonderful person and will always be remembered! He fought a courageous battle and is now free of suffering. Memories of my dear brother-in-law will never die. Our family will never be the same without Gerald; he was so loved. Praying for family and friends. Teresa- We just wanted to let you know that you and your family are in our thoughts and prayers. Our Fraternity Brother is sorely missed, but forever in the Bonds of Delta Kappa Alpha.